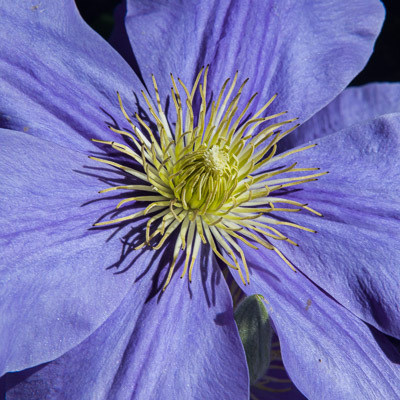 Clematis have to be one of the most popular flowers grown in the UK, and rightly so. There are so many to choose from with colours right across the range, and by mixing varieties you can have something flowering all year round. They can get a bit big though (!) so I was delighted to discover Clematis Fujimusume AGM a few years ago. This is a compact climber, at about 1.2-1.5m high, suitable to grow in pots and it has MASSIVE flowers! 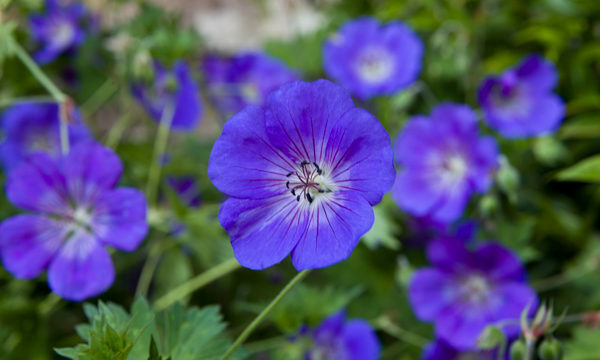 They are a really lovely blue colour (sometimes described as ‘Wedgewood blue’) with a pale yellow centre, and in my opinion this plant looks good growing next to pretty much anything. What’s more this is a Clematis that can cope with shade, plus it flowers for months over the summer. Fujimusume isn’t highly scented, but with everything else it’s got going for it, I can live with that! I have to admit I’m not an expert on roses but when I was looking for a climbing rose for my own garden this was top of my list. Although ‘The Generous Gardener’ is a tall shrub rose (about 5’ high) I have trained it as a climber on a fairly shady wall, and it’s perfect as it doesn’t get too high (maximum 10’). New buds are pink and the flowers are a beautiful soft pink, with petals turning creamy white before they fall. It’s a repeat flowerer too which I think is important for a rose when it’s planted in a key position in the garden. I chose this variety not just because of its disease resistance, beautiful flower shape and colour (and a great name! ), but because it has a lovely scent too – which after all is one of the major reasons for growing roses. Roses are best grown in good soil with regular moisture and feeding. Deadheading throughout the season will prolong flowering. There are so many roses to choose from that it can be a bit bewildering (and I speak from experience! ), so it’s important to research ultimate size and vigour of plants as well as shade tolerance and of course the length of their flowering period and strength of scent. If you can get out to visit rose gardens at this time of year, it’s a great way to see the massive variety of roses at their best. 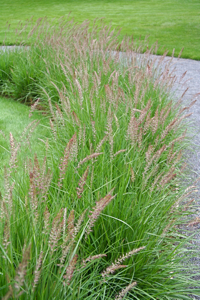 Ornamental grasses have become very popular garden plants over recent years. And it’s not surprising given their long period of interest (often right through the winter). For a sunny garden with light, well-drained soil Pennisetum ‘Fairy Tails’ is a lovely choice. 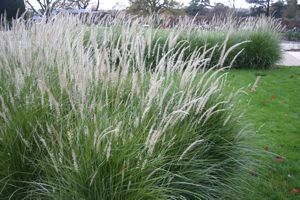 More upright than many Pennisetum (or fountain grass) varieties, it has lovely pale pink flowers from midsummer onwards and makes a beautiful low hedge (although its foliage will die back over winter). It’s such a tactile (and neat) plant it works really well next to a path or seating area. Hemerocallis (or daylilies) are very easy perennials to grow for midsummer colour (generally yellows, oranges, reds and some pinks). They form clumps of strappy bright green foliage (which can provide a great contrast in texture to many other summer flowering perennials so valuable on that count alone) and they are generally tough and reliable plants. Hemerocallis ‘Stafford’ is an evergreen daylily with striking red flowers with a yellow throat. It makes a real statement in a summer border, contrasting well with hot colours as well as blues and purples. Happy in average soil and also clay, they really are easy to grow – as long as they’ve got a reasonable amount of moisture and good light levels. This is an evergreen climber I wouldn’t be without. It has glossy bright green pointed leaves, a lovely twining habit (making it ideal to grow through trellis panels) and is covered in clusters of delicate, star-shaped, jasmine-scented white flowers in midsummer. Hardly surprising then that it’s commonly known as the ‘Star Jasmine’ or referred to as an ‘evergreen Jasmine’. Trachelospermum jasminoides is quite a large plant so it will need good support and space to spread. Also, it’s a little on the tender side – but given a well-drained soil and a fairly sheltered position, should cope very well through even freezing winter weather. Highly recommended!